I don’t usually follow any of our locally-produced TV drama serials; be it English or Mandarin. The first and only time I did was “Masters of The Sea”. Who could forget Koh Cheng Mun’s “I’ll crush him like a cockroach”. So it was a pleasant surprise when I came across “En Bloc”. That the drama has the lovely Andrea Fonseka is not the reason. I quickly recognized a few familiar landmarks. “En Bloc” was filmed using the backdrop of Pandan Valley, a condominium off Ulu Pandan Road. 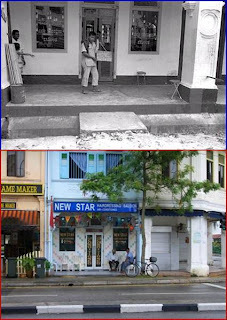 Lim Beng Teck’s Minmart was certainly on the void deck of Eugenia or Chempaka Court. 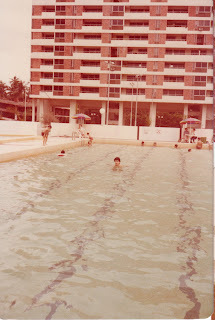 Pandan Valley was the first private condominium built in Singapore and developed at the height of the property boom in 1975. 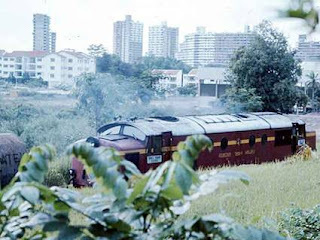 It was left vacant until 1978 when the project was re-launched by DBS Land, the property arm of DBS Bank. Somehow Pandan Valley never gained popularity with expatriates or upper middle-income Singaporeans. Those people preferred Ridgewood, a condominium located behind Pandan Valley. Could it be the case that Pandan Valley was lying in District 21 and Richwood in District 10? There were many other differences between Ridgewood and Pandan Valley. Ridgewood was built and owned by Dillingham Inc. Ridgewood offered a Hawaiian theme for its architecture and the garden-landscape, whereas Pandan Valley had largely a strong “Singaporean” influence of Spartan interior finishes and large floor spaces. The cheapest unit in Pandan Valley was priced at S$98,000 with tower block penthouses going for S$280,000 at that time. Pandan Valley was a mixed development, a first concept for any private sector housing project in Singapore. It had both retail space and residential units. There was the Yamaha Music School at the block nearest to Ulu Pandan Road. Before Pandan Valley was built, it was a hilly terrain with low vegetation. 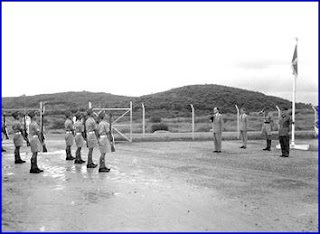 It was frequently used as a training area by 1 SIR in the early 1960s. 1 SIR was the original “tenants” of the former School of Military Medicine. Will Pandan Valley go through an enbloc sale? Stay tune every Wednesday on Channel 5 as the drama unfolds. Land is a much sought-after asset in Singapore, so much so that even cemeteries were converted for public housing. Many of the older cemeteries became sprawling HDB estates. 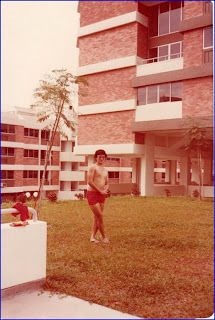 When Singaporeans became more affluent by the mid-1970s, there was a new form of public housing called “HUDC”. HUDC housing was offered in phases, the first phase at Laguna Park but for me I joined in the queue under Phase 3. The estates under Phase 3 included Gillman Heights, Bedok Reservoir and Pine Grove. Unfortunately I was not able to live in any of those HUDC Estates because the stork had arrived early and there was a pressing need to acquire my roof as soon as possible. 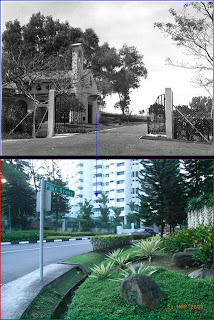 How many of us really knew the original land use of Pine Grove; which is located off Ulu Pandan Road? I used to travel very frequently from my house to town using the Ulu Pandan Road. Ulu Pandan Road was a very quiet place with very few developments. The only prominent landmarks were at 1SIR, 2 SIR and Mowbray Camp. So I could never miss the serene sight of this military cemetery. Even without the photos, I could still visualize the entire cemetery. 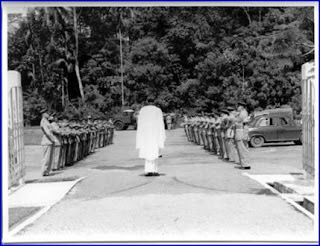 The Ulu Pandan Military Cemetery was one of two cemeteries operated by the British Military, the other was at Dover Road next to an Anglican church. The Ulu Pandan Cemetery was first opened in 1955 and contained over 1,500 remains of British Servicemen of the 3 services (British Army, RAF and RN), civilians employed by the British Military and their families whilst serving in Singapore. It had a small white chapel to the left of the entrance. It was a multi-religion cemetery containing separate burial plots for Catholics, Protestants, Hindu and Buddhist religions. By 1968, the remains were transferred to the Kranji War Memorial. 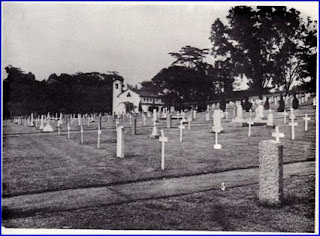 Here are some early 1960s photos of the Ulu Pandan Cemetery. Fig 1: A military burial ceremony at the main entrance to the cemetery. The view is from the cemetery towards Ulu Pandan Road. Below are another 2 ‘old beauties’ that you won’t be able to find on Singapore roads. Let’s see if you can identify them. Please note: these are two different cars. But since they look rather similar, I better number them. Actually, it's purely by chance that I picked two cars that looked so similar in shape, size and colour. 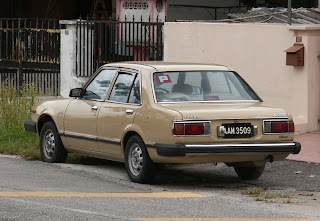 Maybe Ipoh drivers like this colour. So please specify the model and not just the make ok? Full marks to Peter. Car No. 1 is Honda Accord. Car No. 2 is Opel Kadett 1200S. Below are two more photos taken from another angle. 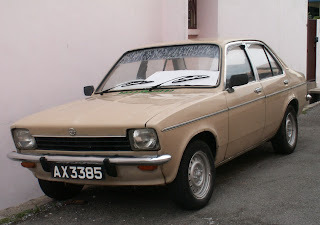 I don't know much about the Opel Kadett. But that model of Honda Accord was very popular in early 80's. It's successor arrived around 1986. Two of my colleagues in NPB bought it and were target of much envy. The other day, I was shopping with my family at NTUC Fairprice when my youngest daughter picked up a can of Jacob’s cream crackers saying that she loved it. “Hey; that’s called Sota-pang”, (or “soda” biscuit in Cantonese) I said. When I was young, we only ate that when we were sick. Jacob’s cream crackers was a very well known brand in the old days. I bet my older readers can recall the iconic flat rectangular can of this brand. What I would like to know is whether their mothers also made them eat this when they were ill. I also vaguely remember seeing this tin can being used to keep donations during funeral wakes - anyone can confirm that? Actually, I never quite liked it. I preferred biscuits which had sugary-cream in between the biscuits, such as the lemon puffs; which I still buy from the supermarket. Nowadays, such biscuits come in plastic packaging. When we were young, we would buy them by katis. The shop keeper would transfer them from a big tin can and wrap them in newspaper folded into a conical shaped. Another ‘sick’ food that I can recall is Glucolin (glucose). This is a very fast to prepare energy drink which my wife and I also used to feed our kids when they were young. In Cantonese we call it Pu-to-tong (葡萄糖)。 I don’t think the packaging of this product has changed over the decades. It still comes in a circular blue tin with the glucolin packed in a translucent waxy paper or plastic bag. Yet another one is Quaker Oats. Like the Glucolin, I think there is little change in the packaging of this product. The only difference is that nowadays they have a pre-cooked version where you simply add hot water to it. Like the cream crackers, I did not quite like this because it wasn’t sweet. What I would do is add condensed milk to it. Come to think of it, I suspect that for kids of my generation, anything that wasn’t sweet didn’t appeal to us. The final ‘sick’ food that comes to mind is macaroni which is called Tong-sum-fun in Cantonese. Again I did not like it. But I do recall that in my secondary school days in ACS Barker Road, there was a stall that sold excellent macaroni. I blogged about it before here. Anyway, as an adult I never liked the above ‘sick’ foods. I wonder if there is some psychological reason behind this; you know; like associating them with the unpleasantness of falling sick. PS: For an explanation of why this is called ‘cream crackers’, and what the original tin can looked like, read this Singaporean blogger’s post about the Jacob’s cream crackers here. 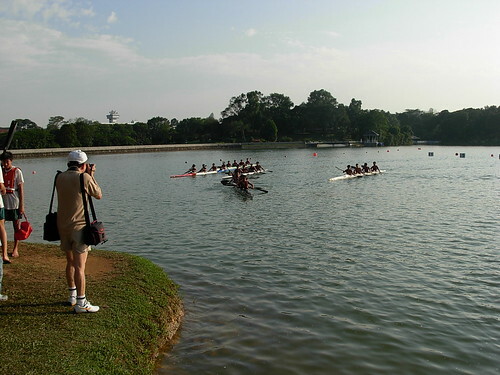 The 8th National Schools Dragon Boat Championship was held on Saturday, 12 April at the Bedok Reservoir. I have written a short report for the folks at Red Sports here. Harry was in town recently and told me his one wish was to have a hair-cut, not just any ordinary hair-cut. 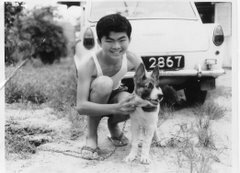 It had to be that “Mama Barber” somewhere in the eastern part of Singapore, and that was because Harry was serving in RAF Changi and had lived in the area some 40++ years ago. Harry tells me that in England, senior citizens pay S$10 whereas others pay S$40 but then, most English barbers are ladies and don’t provide shaving. Harry had already tried out 3 different kinds of barbers in Singapore, a Chinese barber, a Malay barber and of course a lady barber in a span of 3 weeks. Now in Malaysia, it is not all that difficult to find an authentic Indian barber shop but certainly not in Singapore (except maybe in Little India), and the same barber who did Harry’s hair 45 years ago. 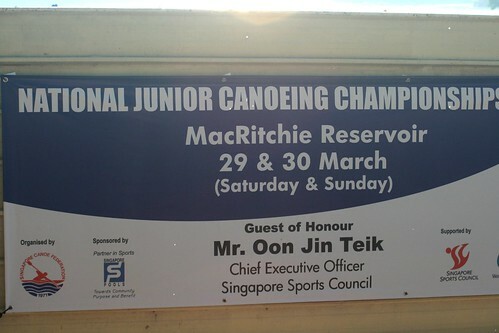 Last weekend, I was at the MacRitchie Reservoir to watch the 5th National Junior Canoeing Championships. I have written a brief report for my friends at the Redsports here. Unlike last year, my shutterbug friend was not able to join me to help me take some nice photos of this event. Thus, in spite of some last minute coaching by my sifu on how to use a DSLR, my pictures turned out quite terrible. So this time round, I will just show you ‘non-action’ photos. Below is a shot of the place where the real action took place. 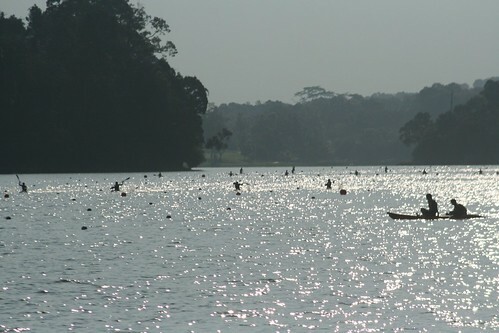 During the late afternoon when the finals took place, the sun was behind the boats as they raced in. I really had no idea how to handle the shots. The 3 photos below are much better because they were taken at the launch area where the sun is shining in from the left. 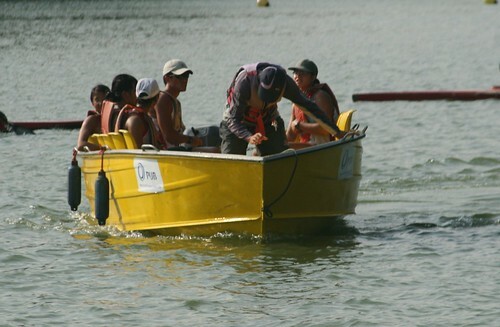 This is the safety boat. 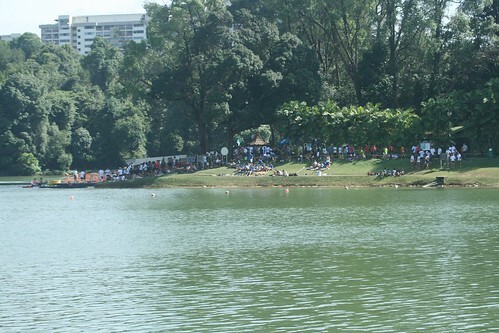 They have just picked up some girls who did not like the heat of the competition and decided to take a dip in the cool waters of MacRitchie. 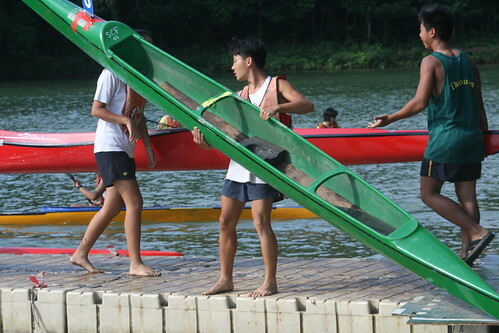 The organisors at Singapore Canoe Federation should be congratulated for having done a great job this year. The guys below are a group of enthusiastic Raffles supporters. 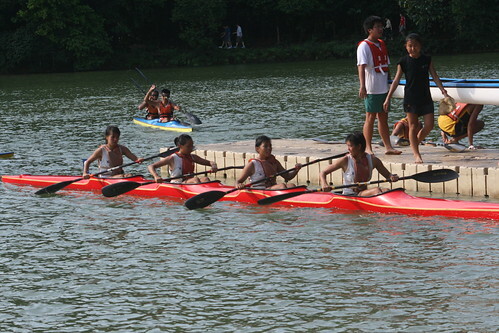 In comparison, ACS (I) kayakers had only a few parents and a handful of (tired) fellow team mates to cheer them. At one point I was almost deafened by the shouts of Raffles! Raffles! Raffles. I wanted to teach the few ACSians beside me to shout the cheer that we adopted in ACS in the 60’s: A-A-ACS; beat-beat-beat RI! But I decided it was unwise. Those burly Rafflesians may decide to ‘accidentally’ bump this oldie into cool waters of MacRitchie. In any case, they were from RJC not RI. The photo below shows the boat shed where lots of movements of boats were taking place. To the right is the tent where the prizes were presented. Just next to it was a huge, unsightly rubbish container. 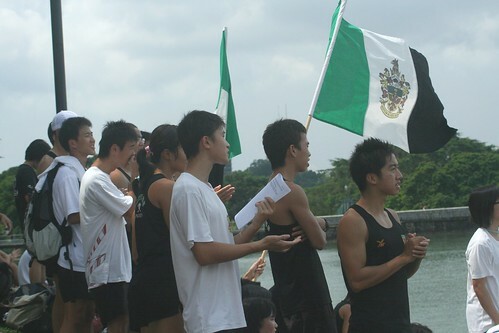 As in last year, the rowers from NJC disappeared mysteriously right after the last event. 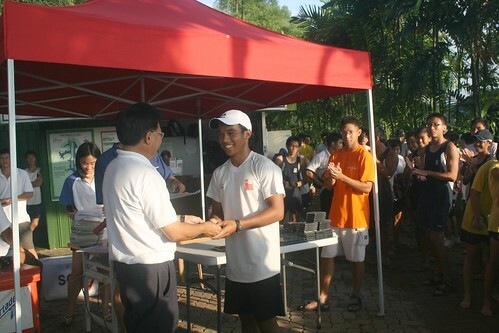 The only one left to collect the numerous prizes was this cheerful Malay boy. 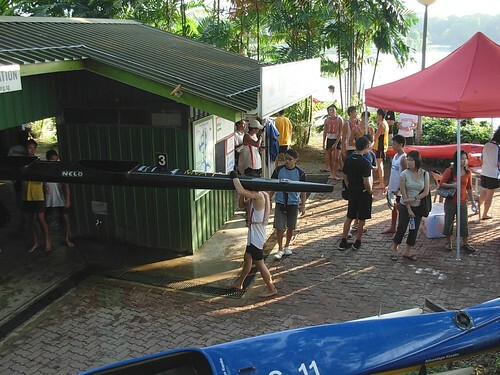 On my way home, I saw the NJC rowers gathered near the car park. 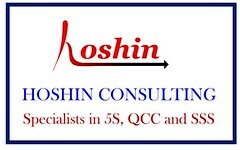 Maybe their coach is like our first NJC principle Mr Lim Kim Woon who liked to give long talks. He once gave us boys an hour-long lecture on the correct way to use the boys toilet. The year was 1969. If you don’t believe me, just ask any pioneer batch NJC old boy. I am sure he would not have forgotten this unique experience! For some strange reasons, I never pick up the game of majong, although I often watch my grandmother, my aunties or their “kakis” have their afternoon sessions. 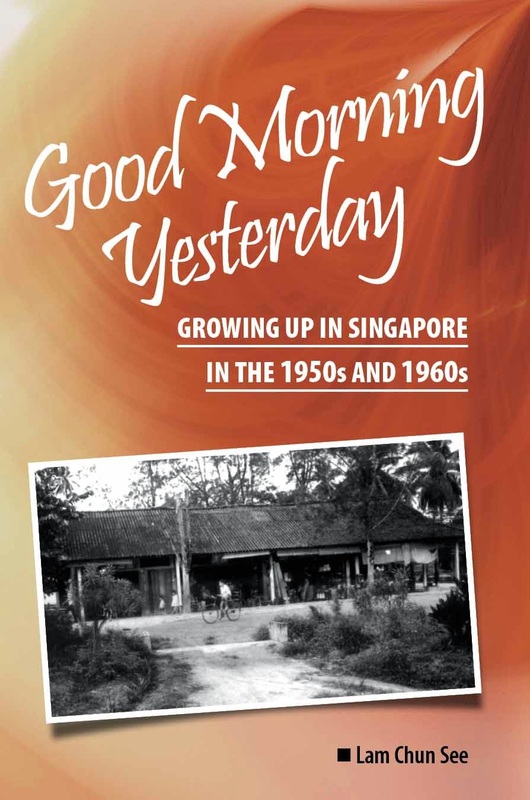 My grandmother only invited folks who were Cantonese-speaking and who lived in the Tiong Bahru SIT estate area. Sometimes my grandfather participated because someone backed-out at the last minute. So having male players was the exception. My very first introduction to majong was probably before I went to primary school. My grandmother was responsible for setting up the table and covering the top with the smoothest white paper my eyes ever saw. My “duty” was to greet each aunty and offer them their favorite drink. I was also tasked to do the refilling when ever I spotted the glass or cup empty. Chinese Jasmine tea and black coffee were the popular drinks. The drinks were placed on a small wooden stool next to each player. If my grandmother won the game that day, I was sure to get rewarded with my favorite “Ku Lu Yoke” from San Hoi San, the Cantonese cook across our flat. If she lost, she would not speak and I would not dare to ask her “what’s cooking for dinner”. This game fascinates me. 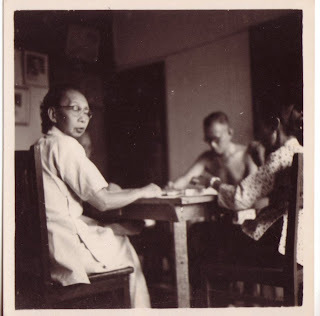 I always wondered why someone would shout “Pung” very loudly, utter swear words, open small little boxes below the table and exchanging little colorful plastic tokens. There was the “breast stroke” motion of moving the tiles around on the table, and arranging the tiles into 4 rows at 90 degree to each other. I saw each player taking turns to take the tiles from the center of the table. Then the game ended with a shout of “Pung”. The game commenced shortly after lunch (when “Lai Dai Soh” came on the air) and ended just before dinner time because it was my uncle’s turn to listen to “American Top 40”. Perhaps If I took to the game, I would have achieved wonders for my Chinese Second Language in school.